The news came as parent company HMV revealed a further slide in sales since its disappointing Christmas. Like-for-like sales - which ignore new store openings - in the UK and Ireland for the 16 weeks to 29 April were down 11.4% at HMV and 5.6% at Waterstone's. Despite heavy supermarket and internet competition, HMV said its full-year profit would meet analysts' forecasts. The company said it had seen encouraging results from a trial in six stores in South Wales and Kingston-upon-Thames where it has been offering reduced prices with the help of suppliers. HMV also relaunched its website in March after it moved its processing operations to Guernsey, where it can take advantage of a tax loophole to sell CDs, DVDs and computer games without charging VAT. Waterstone's said it would offer more than three million titles on its new website and would attract customers with author insights, try-before-you-buy offers and personal shopping services with help from knowledgeable booksellers. 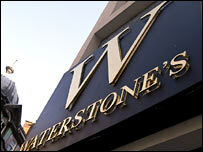 "Waterstone's has been undertaking a strategic review of its internet activities for some time and we have concluded that the time is now right to launch its own online service," said Waterstone's managing director Gerry Johnson. Earlier this month, Tim Waterstone, the founder of the Waterstone's book chain, withdrew a £280m offer to buy back the business from HMV, complaining that the conditions HMV had imposed on his consortium were too punitive.